The masterpiece of the “Collegiata” is the Majestic altarpiece made of painted earthenware, made by Mattia della Robbia (Florence, 6th April 1468 – 1453). 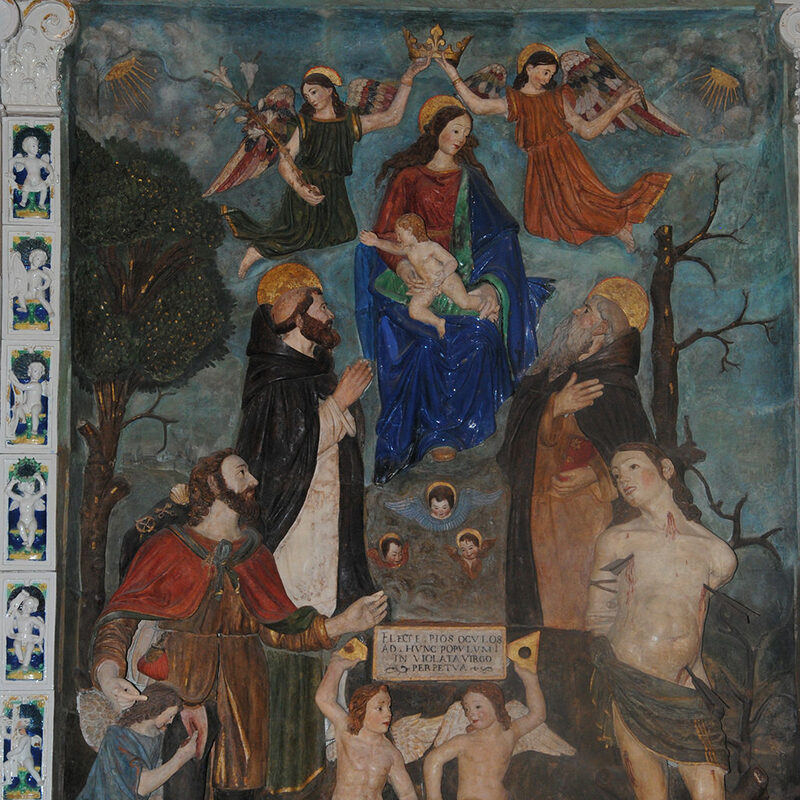 The altarpiece built between 1527 and 1532, is important not only for its unusual dimensions but also because is the only recognised work of one of the last exponents of the Della Robbia’s Florentine bottega, extremely famous in the XV and in the XVI century for its production of ceramic products. The work was done by Mattia della Robbia (at first helped by his brother Ambrogio, who unfortunately died soon after) and paid by the Town Hall with the intention of obtaining the Virgin and Saints’ intercession to avoid a terrible plague. The main picture represents the Virgin with Baby Jesus among Saint Sebastian, Saint Rocco, Saint Anthony and Saint Peter. In the predella there are Jesus Christ’s childhood stories alternated with some fruit decorations typical of Della Robbia’s production. Each of the two lateral pillars is decorated by seven angels who are holding some symbols of Jesus Christ’s Passion and some cartouches, by five empty niches and by an external braid. At the base of the pillars there is the coat of arms of Montecassiano, which has only five hills and two stars because the cross which can be seen today, was only introduced in 1549. In the lunette an enormous Blessing God is sided by angels who played different instruments and is surrounded by some decorations and cherubs. Above God’s head there is the date of the beginning of the work (MDXXVII).